A seven-year-old girl in Nepal has been declared a goddess because she has “eyelashes like a cow” and a “voice as clear as a duck”. Now the youngster’s parents have had to leave their jobs because under Hindu tradition she is not allowed to leave her home except for special occasions – and her feet can’t touch the floor. 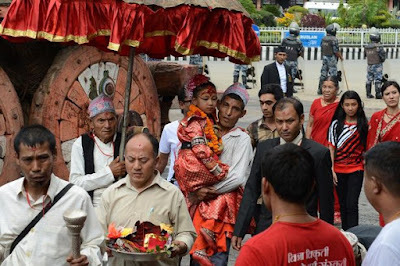 Nepalese prime minister Pushpa Kamal Dahal even had to bow before the ‘Kumari’ girl, who is called Yunika, as he paid respect to her along with thousands of others at the religion’s annual festival of rain. 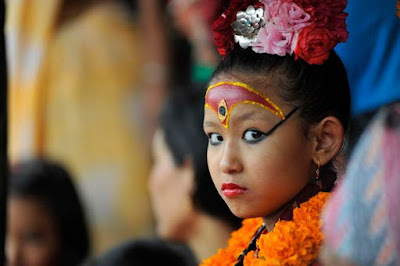 The child is thought to bring good luck to those who look at her after being declared by royal priests and officials as a living incarnation of the goddess Durga in an ancient Hindu custom. But when Yunika hits puberty, she will revert back to being a normal member of society. “When my daughter was selected as a Kumari, I felt very happy. 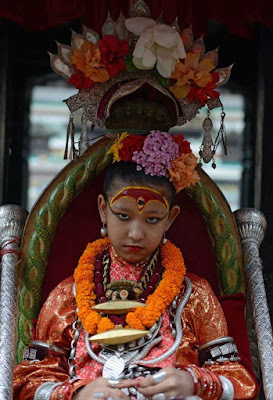 “It's because Kumari is hugely regarded and respected living goddess in Nepal.”The criteria is extreme – with children needing “eyelashes like a cow”, “thighs like a deer” and a “voice as clear as a duck”.